I made a Spaghetti Squash bowl before and really loved it. 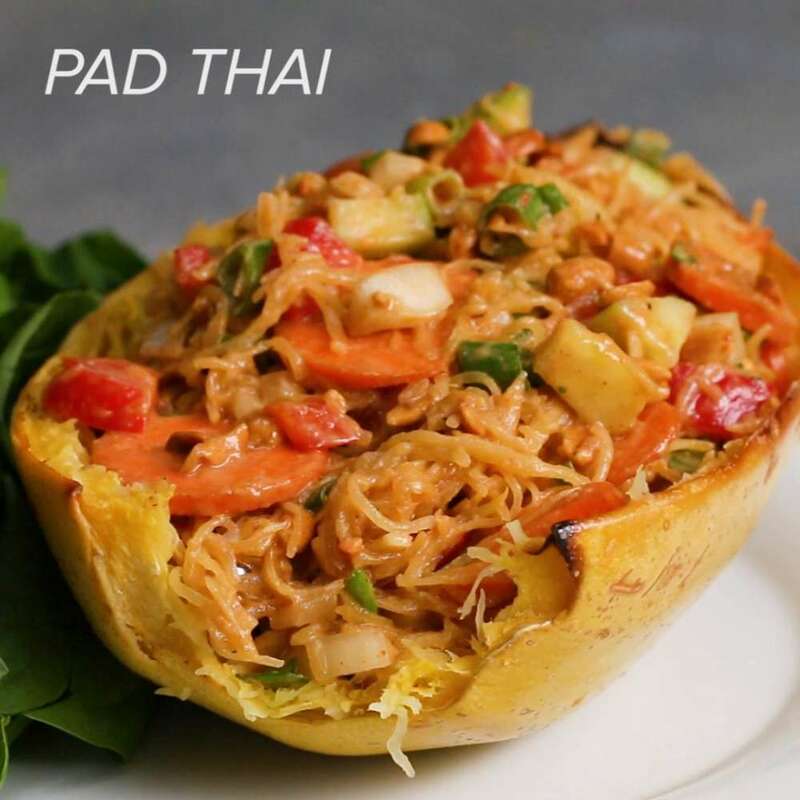 When another Spaghetti Squash 4 Ways video appeared on Facebook the other day - one over several out there - I decided to give the Pad Thai version a try. The original recipe is on a site called Tasty.co and this recipe lived up to that description. It was tasty. While most of the recipe I used as is, there were a few minor changes to suit our family. My husband and youngest son are serious meat eaters, so I added some shredded chicken to the mix. I didn't feel it needed both raw green onion and regular onion, so just went with the green onion. I used shredded carrots instead of sliced. As they are not cooked I felt this would be easier to eat. And last but not least I cut back the Sriracha Sauce slightly as my husband doesn't like things too spicy. All those changes are reflected in the recipe below. You can view the original recipe HERE. The only thing I want to address when I try this in the future was I found it a little soupy, which made it a little messy to eat. Not sure exactly why, but I suspect the hot spaghetti squash on the raw vegetables drew out some moisture. I may try less sauce next time or may cut out the water in the sauce. It can always be added back in. For anyone interested, here is the original video with all 4 ideas at the bottom. 2 T Sriracha (I cut this down slightly for my family, but it's really not hot). Chopped or crushed peanuts and additional cilantro. With a sharp knife, slice the squash in half. Scoop out the seeds, brush with oil, and sprinkle with salt, and pepper. Bake for 40-45 minutes, or until a fork can easily pierce the skin. Mine took longer so I finished off with a couple minutes in the microwave on high. You don't want it mush though, so err on the crunchy side. While they are cooking, combine water, soy sauce, sesame oil, honey, lime juice, Sriracha, peanut butter, ginger, and garlic in a bowl, stirring to combine. I found this hard to mix in, so you may need to warm the mixture in the microwave or in a sink full of hot water. Once the peanut butter is warm, it's easier to combine. In a bowl mix together the cucumber, carrots, peppers, green onions, onions, peanuts, cilantro, and sauce. Remove squash from the oven, with a fork pull at the edges to produce that stringy “spaghetti” quality. Add the spaghetti squash to your bowl of vegetables and drizzle with the sauce. Mix well. Serve in the squash shell garnished with cilantro and peanuts.